This article is about the Caribbean island group. For the western islands of French Polynesia, see Leeward Islands (Society Islands). For other uses, see Leeward Islands (disambiguation). Not to be confused with Leeward Antilles. "Leewards" redirects here. For the direction, see Leeward. For the former store, see Leewards Creative Crafts. For other uses, see Leeward (disambiguation). The Leeward Islands are labelled on the map's middle right side. The Leeward Islands /ˈliːwərd/ are a group of islands situated where the northeastern Caribbean Sea meets the western Atlantic Ocean. Starting with the Virgin Islands east of Puerto Rico, they extend southeast to Guadeloupe and its dependencies. In English, the term Leeward Islands refers to the northern islands of the Lesser Antilles chain. The more southerly part of this chain, starting with Dominica, is called the Windward Islands. Dominica was originally considered part of the Leeward Islands, but was transferred from the British Leeward Islands to the British Windward Islands in 1940. The name of this island group, Leeward Islands, dates from previous centuries, when sailing ships were the sole form of transportation across the Atlantic Ocean. In sailing terminology, "windward" means towards the source of the wind, while "leeward" is the opposite direction. In the West Indies, the prevailing winds, known as the trade winds, blow out of the northeast. 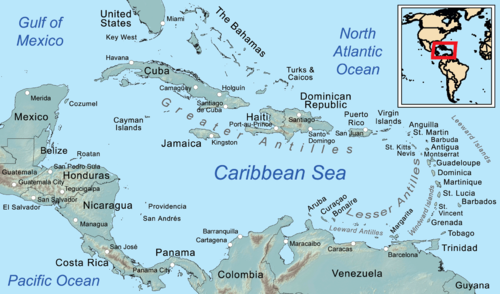 Therefore, an island to the northwest, such as Puerto Rico, would typically be leeward of an island to the southeast, such as Antigua, and conversely, Antigua would typically be windward of Puerto Rico, but leeward of Guadeloupe and Martinique. The early Spanish colonizers called Puerto Rico and the islands to the west Sotavento, meaning leeward. The islands to the south and east of Puerto Rico were then called Islas de Barlovento, meaning "windward islands". When the British gained control of many of the Lesser Antilles, they designated Antigua, Montserrat and the islands to the north as the "Leeward Islands". Guadeloupe and the islands to the south were designated as the "Windward Islands". Later on, all islands north of Martinique became known as the Leeward Islands. In 1940 Dominica was transferred to the British Windward Islands, and is now considered to be part of the Windward Islands. However, even in modern usage in languages other than English, e.g., Spanish, French and Dutch, all of the Lesser Antilles from the Virgin Islands to Trinidad and Tobago are known as the Windward Islands (Iles au Vent in French, Bovenwindse Eilanden in Dutch, and Islas de Barlovento in Spanish). The islands along the Venezuelan coast, known in English as the Leeward Antilles, in languages other than English are known as the Leeward Islands. The islands are affected by active volcanism, and notable eruptions have occurred in Montserrat in the 1990s and in 2009 to 2010. At 1467 m, the highest point is La Grande Soufrière in Guadeloupe. The Caribs, after whom the Caribbean is named, are believed to have migrated from the Orinoco River area in Venezuela in South America to settle in the Caribbean islands about 1200 AD, according to carbon dating. Over the century leading up to Columbus' arrival in the Caribbean archipelago in 1492, the Caribs mostly displaced the Maipurean-speaking Taínos, who settled the island chains earlier in history, by warfare, extermination and assimilation. The islands were among the first parts of the Americas to fall under the control of the Spanish Empire. European contact commenced with Christopher Columbus's second voyage, and many of the islands' names originate from this period, e.g., Montserrat was named in honour of Santa Maria de Montserrat (Our Lady of Montserrat), after the Blessed Virgin of the Monastery of Montserrat, which is located on the Mountain of Montserrat, the national shrine of Catalonia. 'Mont serrat' in Catalan means 'saw mountain', referring to the serrated appearance of the mountain range. The Leeward Islands became a British colony in 1671. In 1699, prior to the War of the Spanish Succession, Christopher Codrington became the governor of the Leeward Islands. The war lasted from 1701 to 1714. Daniel Parke II was the British governor of the Leeward Islands from 1706 to 1710. He was assassinated during a mutiny triggered by his self-enriching enforcement of Stuart imperialism. Although comparatively much smaller than the surrounding islands in the Caribbean, the Leeward Islands posed the most significant (though decidedly less severe in comparison to the colonies) rebellion to the British Stamp Act. In 1816 the colony was dissolved, with its last governor being James Leith. In 1833, the colony was reformed. From 1833 until 1871, the Governor of Antigua performed the duties of the Governor of the Leeward Islands. Today the Islands are governed by a number of national and colonial administrations. ^ J. C. Hart and W. T. Stone (1982), A Cruising Guide to the Caribbean and the Bahamas, Dodd, Mead & Co., p. 601, ISBN 0-396-08023-5. ^ Sweeney, James L. (2007). "Caribs, Maroons, Jacobins, Brigands, and Sugar Barons: The Last Stand of the Black Caribs on St. Vincent", African Diaspora Archaeology Network, March 2007, retrieved 26 April 2007. ^ O'Shaughnessy, Andrew (April 1994). "The Stamp Act Crisis in the British Caribbean". The William and Mary Quarterly. 51 (2): 203–226. doi:10.2307/2946860. JSTOR 2946860. Wikimedia Commons has media related to Leeward Islands.